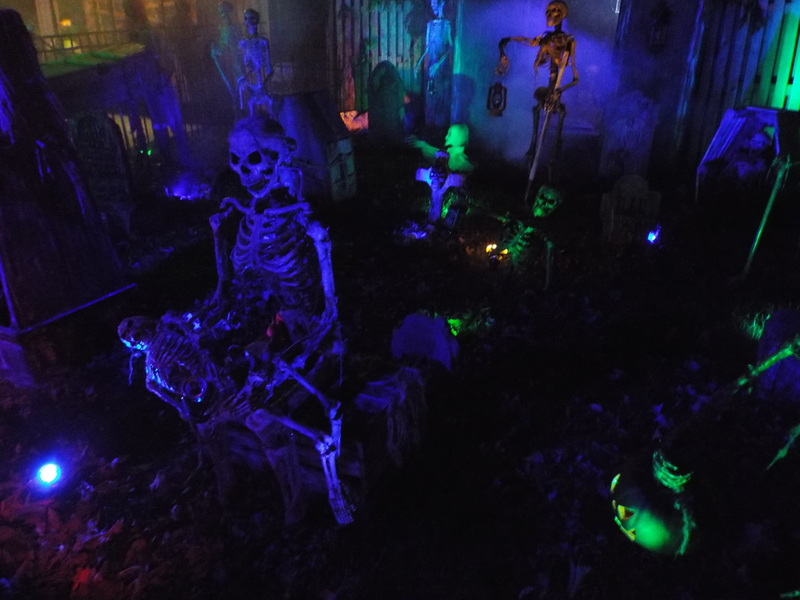 Dark Shadows consists of two parts - a cemetery display in the front yard and a walkthrough in the garage. 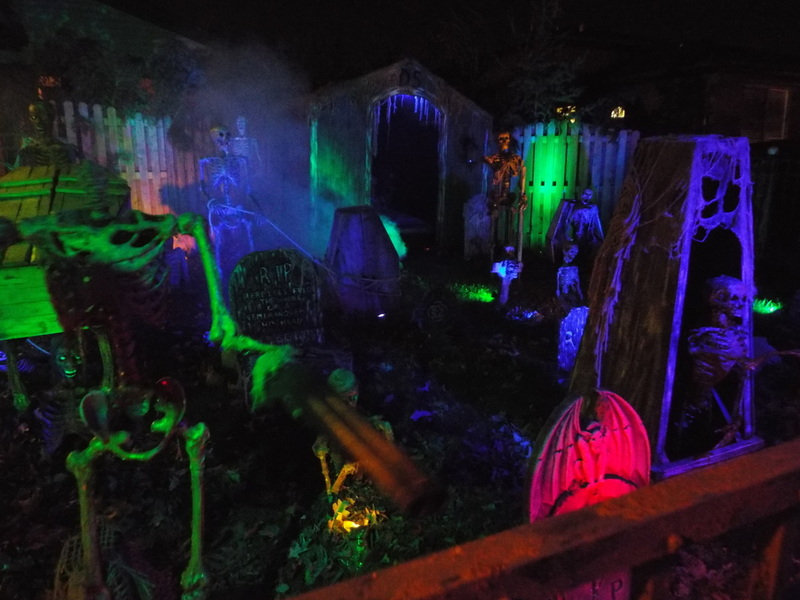 All of the props in both the cemetery display and the garage are hand made, and many of them are mobile or animated in some way. The cemetery scene has a skeleton theme, and features lots of moving skeletons, including one in a tree that spits fluid at you, a skeleton holding his decapitated skull in his hand, and even one walking a dog. 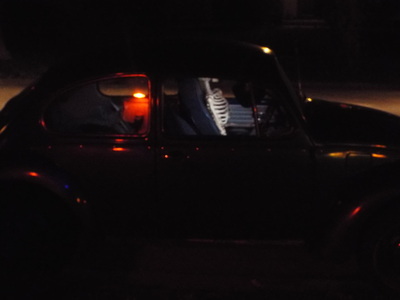 This year there was even a skeleton in a Volkswagen Beetle parked on the street. Each of the animated props is bathed in some eerie lighting, from red to blue to green to purple, and the entire setup is complemented by the sounds of thunder and the flickering of "lightning" overhead. 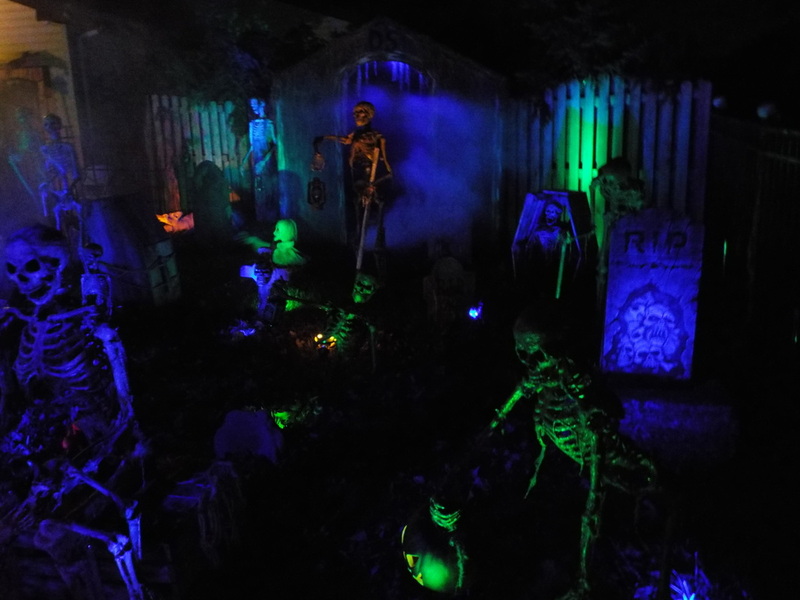 It's a great display, and it would make Dark Shadows worth it if that's all there was. Fortunately, though, there is more. 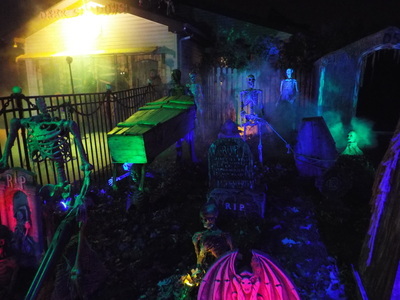 The entire garage is a walkthrough that gets updated and changed around every year. 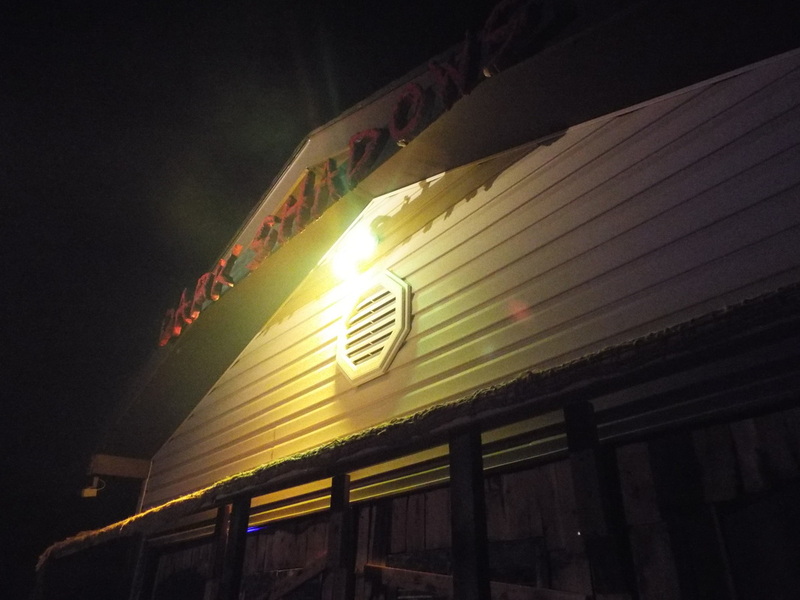 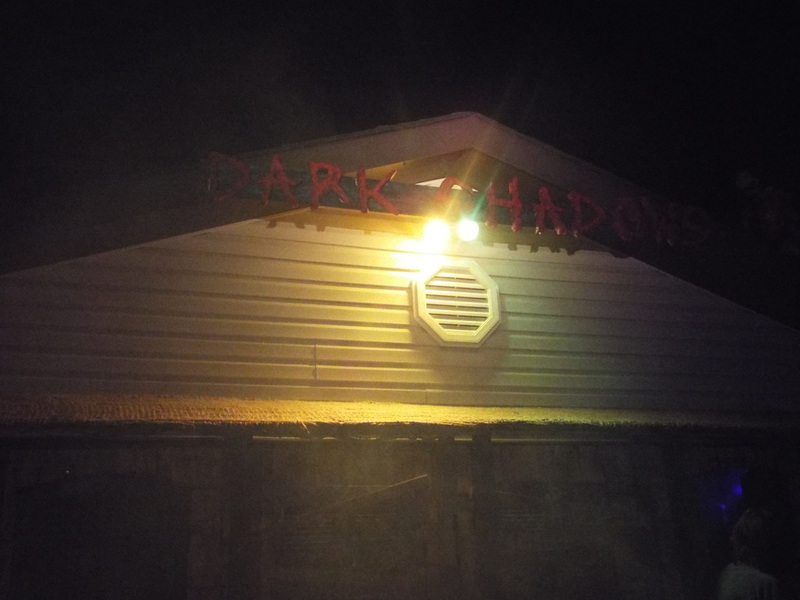 The outside of the garage is done up like an old shack with a wooden front, and the Dark Shadows name is emblazoned on the top. There's even a skeleton looking down from the roof, just in case visitors get too unruly. 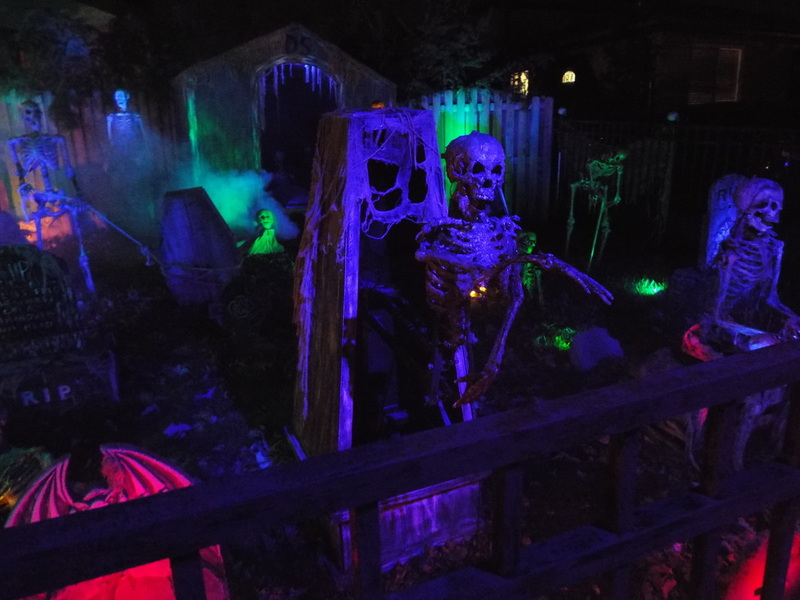 Although the garage is not that large, the clever setup inside makes it seem bigger than it really is, and manages to pack several rooms into a small space. One of our favorite areas inside is a swamp scene, which always impresses us, given that it looks and feels like a swamp but it's in someone's garage! Also, there is always a clever surprise at the end, right before the exit. 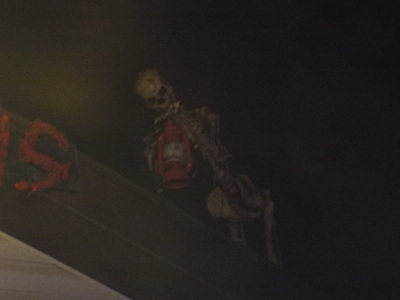 We've seen Mike Myers, loud banging oil drums and more. It's hard to beat Dark Shadows for its atmosphere. 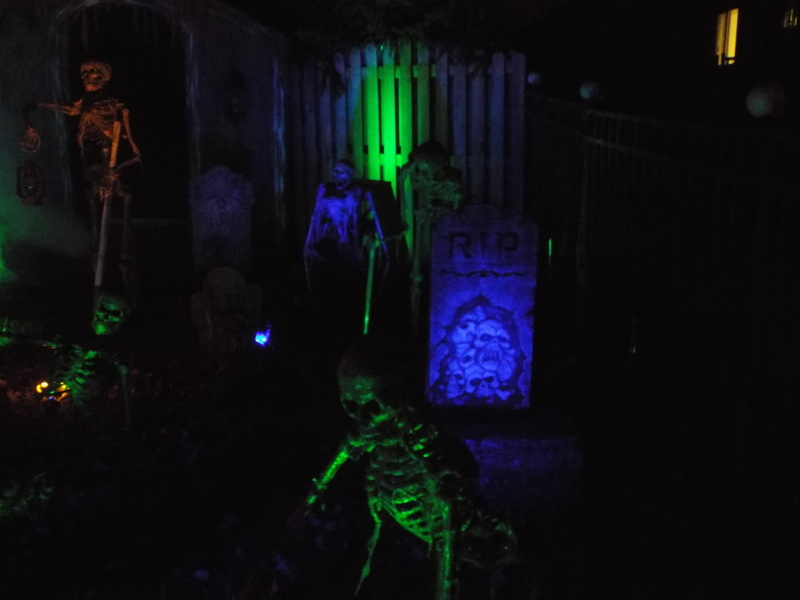 The hard work put into it really shines, and we make a point of visiting this one every year. 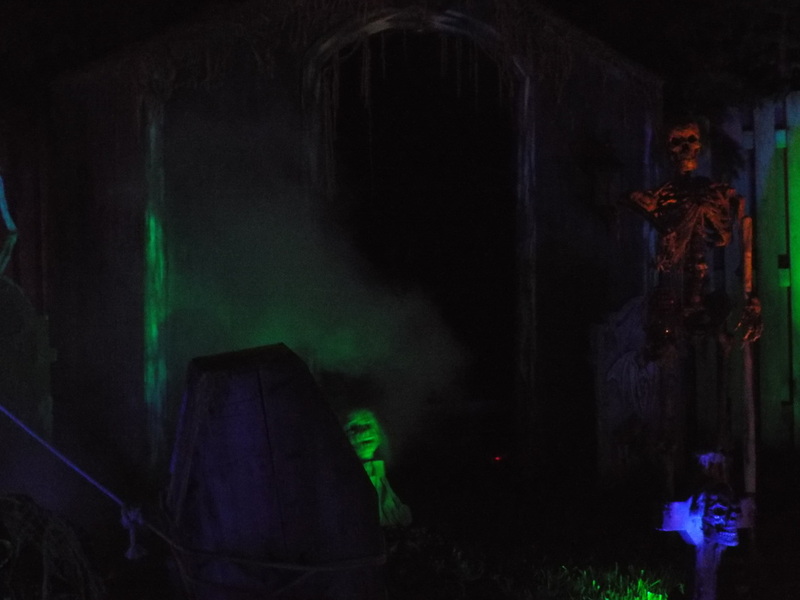 It's really fun to just look at all of the props and see how well crafted they are, and the garage haunt is always good for a startle or two. 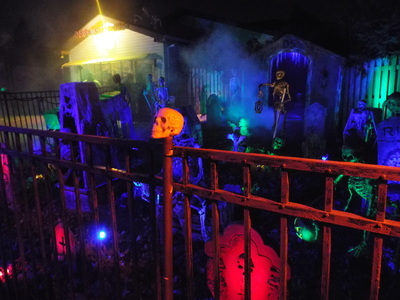 For those thinking that home haunts aren't worth it - think again. 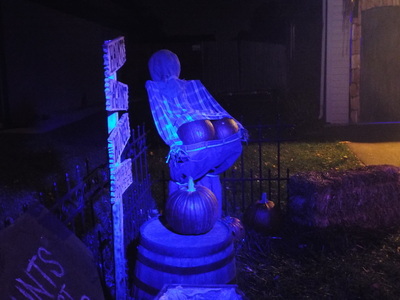 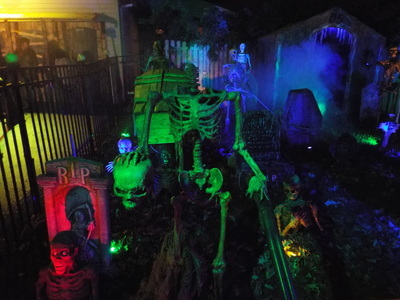 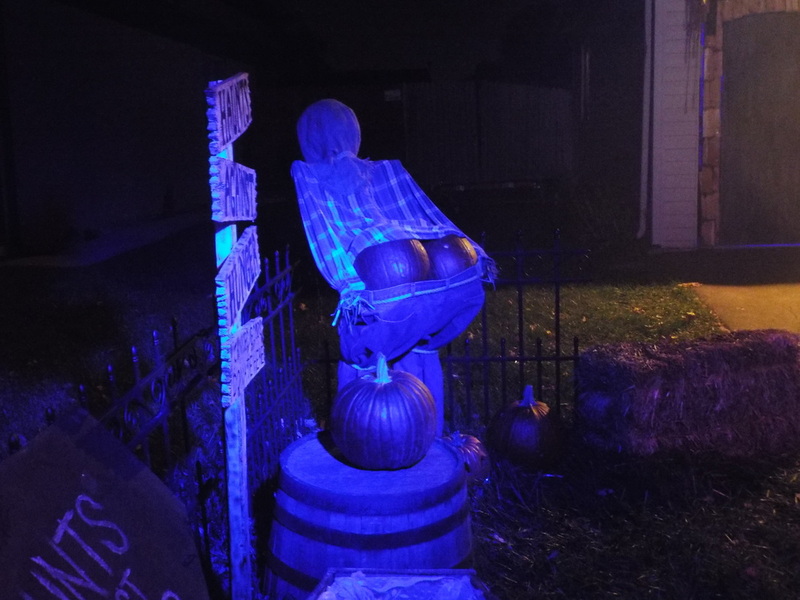 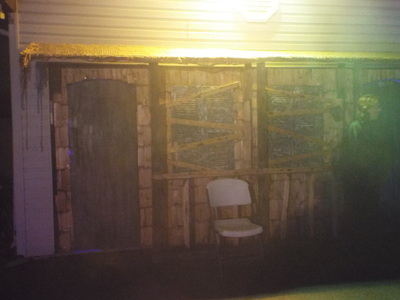 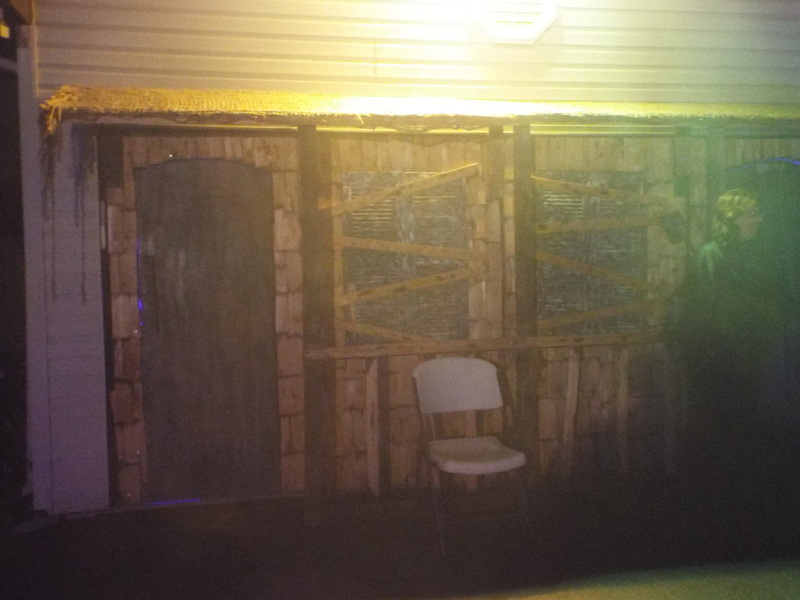 For no cost (unless one wants to donate), one gets a display and a haunted house walkthrough. If you don't like it, what have you lost but time? Do yourself a favor and check Dark Shadows out - you'll be glad you did!